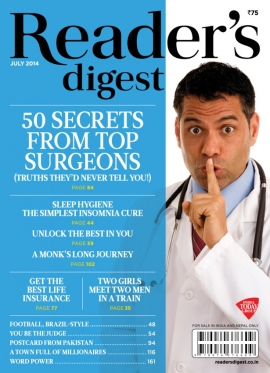 The August 2014 issue of Reader’s Digest magazine (India edition) is out quite on time, we however were caught in some tight schedules and the reviews for the same are delayed. This issue carries forward the attractive new layout with only one change, the half fold cover page is not there this time. But it doesn’t affect to the magazine content or quality by any means. The yellow and black combination makes the cover page attractive. The editorial is about career prospect. It highers the expectations from the article about the Career oriented article by Sumit Choudhary. In recent past we have seen how influential “the Internet” is, when we have to consider revolutions. The genuine issue or awareness raised by even a single person turns out into a movement in just few moments. It is very easy to communicate about valid cause(s) and get support from the entire world these days. There is one such article in – everyday heroes – segment which talks about Ricken Patel and his activism. The article is good to go for. BTW: you can read more about him and his organization at: http://www.avaaz.org. Kindness of Strangers – is one of our favorite segment in RD as it brings real life incidents which reinforces our faith in humanity. This time there are interesting incidents discussed and it is worth reading. Sometimes a small gesture isn’t small as it’s impact and after-effects are very much important for the people associated with it. Take an example of the fellow who got his shirt dirty when he was on the way to interview and how a professor helped him (discussed in the article). Voices and views – segment discusses some manners and etiquette in Q-A manner. However all the points mentioned in the article are almost “obvious”, it is still interesting read. Why it is great to be a nerd – article could have been more detailed and interesting. The magic world of graphic novels – will interest the literary lovers for sure. In my opinion – segment is worth a read discussion about business politics. Sometimes some proven mind tricks (eg. maintain direct eye contact when giving a speech) can backfire if done wrong. There is an article about such 7 tricks and how one needs to take care when implementing them, is interesting read. 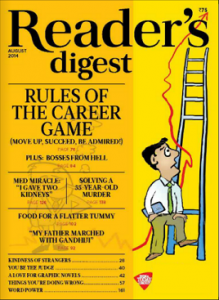 The cover story by Sumit Caoudhary is really interesting and those who are taking initial steps in their career should not miss it. However we have expected much more from the article. May be his book contains all those stuff, as the canvas of the article is shorter. Bosses from the hell – is about weird bosses and his/her gestures. You can read it for time pass. My Father, Bapu’s Trusted Dairy Expert – is a small memoir about Titusji, who was with Mahatma Gandhi in several freedom fighting movements including – Dandi march. It is good to know about such a genuine character. Whatever we say, people’s quest to keep themselves thin and reduce the belly fat will always be there. One however needs to take care that starving is not the answer. Right food habits and disciplined life style is the only way to achieve a healthy body. The article – Get a 21 day Tummy – talks about the content of the book of same name. Truth is stranger than the fiction – we’ve often heard this. The article about a man – who was playing golf while he fell through a hole – proves it again. His survival instincts and real time help by his true friends save his life. It is not just a story about something strange happened to someone, it also explores the humanity and positive attributes we see in people. These people (who help others) makes the world the better place to live. Lia Grainger takes us to the trip of a village in Romania where people still practice the old way of living and farming and live in peace. They are not living like tribesmen, just to clarify. In – Medical Miracle – section the story of Julie is explored. She was caught in a situation where her husband and father both need kidney transplants! What she have done in such situation? It is one more tale which explore the generous side of people and the importance of “love”. The writing style of the article is not upto the mark though, it could have been more effective. See the world differently – the pictures in areal and zoomed view are not to miss. The words “gravity is no match for these alpine ibex goats” are literally true. And you really need to watch it to believe it. Taken – is a crime thriller article which explores one of the real incidents. It is one of the most talked and unresolved cases of kidnapping and murder. An article about the technologies used in the movies like – Dawn of the Planet of the Apes – is good to read the summary of such technology. The article however could be more interesting if written in detail. Overall an issue worth your money and time you spend for it.